This park honors Francis Lewis (1713-1802), an early American merchant, patriot, and co-signer of the Declaration of Independence. Born in Llandaff, Wales, Lewis became an orphan at a young age. He completed a merchant apprenticeship in London, then traveled to America in 1738. The entrepreneur established a successful trading company in both New York City and Philadelphia, and grew rich from supplying goods to British troops during the French and Indian War (1755-1763). In 1745, Lewis married Elizabeth Annesley, the sister of a business partner. Having accumulated great wealth, Lewis retired from trade in 1765 and moved to Whitestone, New York. Lewis’ political career began in 1774, when he served as a New York delegate to the Provincial Convention. The convention elected Lewis to the Continental Congress, where he served from 1775 to 1779. On July 4, 1776, Lewis signed the Declaration of Independence, which proclaimed the colonies forever absolved from allegiance to the British crown. The British reaction, during fall 1776, was to destroy Lewis’ home and abduct his wife Elizabeth. Although the British did release her, Annesly died prematurely in 1779, due to the harsh conditions of her captivity. During the course of the Revolutionary War (1776-1781), Lewis served on two powerful committees: the Secret Committee, which imported munitions, and the Marine Committee, which administered naval affairs. Defeated for reelection to the Continental Congress 1779, Lewis nevertheless was appointed to the Board of Admiralty, which replaced the Marine Committee. In the years before his death, Francis Lewis served as a vestryman for the Trinity Church in New York City. The Whitestone community that Lewis made his home has a long and rich history. Dutch farmers founded the Whitestone in 1645, naming the area for a large white boulder that broke the tides along the shore. The Dutch had purchased the land from the Matinecock Native Americans at the price of one ax per fifty acres. In 1735, the discovery of clay deposits precipitated the widespread growth of pottery manufacturing. During DeWitt Clinton’s tenure as New York State Governor (1817-23, 1825-8), the community referred to itself as Clintonville. The discovery of a hot spring on 14th Street and Old Whitestone Avenue, during the mid-19th century, brought the area notoriety as sanctuary for anemic patients. During this period, New Yorkers referred to the town as Iron Springs. 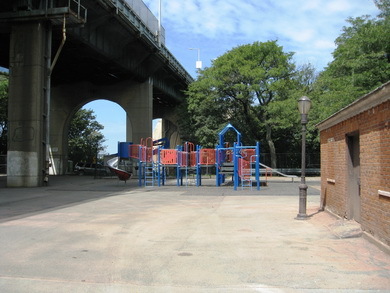 Francis Lewis Playground is located on 42nd Avenue and Francis Lewis Boulevard. In 1953, Parks acquired the property. Three years later, the playground opened, serving of the adjacent P.S. 130 school and the youth of the local community. Today, Parks and the Board of Education jointly operate the property. The playground boasts modular play equipment, benches, two handball courts, a flagpole with yardarm, safety surfacing, a box-ball court, a full basketball court, two basketball standards, swings, and slides. In April 1995, the playground received a $300,000 renovation. Sponsored by Mayor Rudolph W. Giuliani, the improvements included the installation of new play equipment and safety surfacing and rehabilitation of the basketball court.